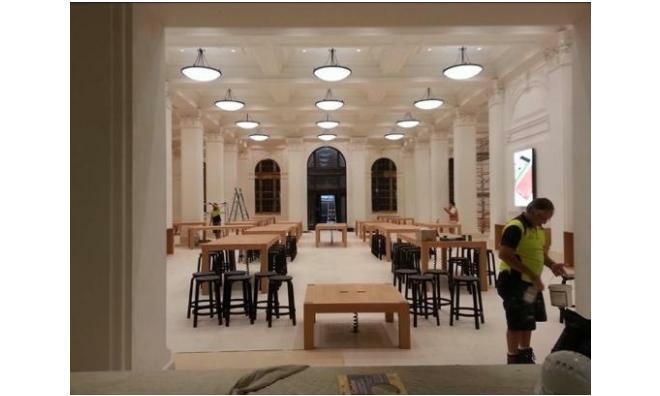 A number of leaked photos purportedly taken from within Apple's newest flagship Apple Store in Brisbane, Australia hit the web on Tuesday, showing the outlet's general layout ahead of its grand opening this Friday. Apple's Brisbane store is finally set to open this week after over two years of setbacks, but until today the interior design of the location was widely unknown. Coincidentally, however, two sets of photos have been published showing the upcoming Apple Store in various states of preparation. The first batch, which comes from The Reckoner, appears to be older and includes low-resolution shots of product signage, scaffolding and empty display tables. Another, more recent set, published by MacRumors shows display tables with chairs, MacBook displays and what looks to be accessory shelving. In both sets, massive columns within the MacArthur Chambers building are easily distinguishable and give the location a different feel than other Apple Stores, which are usually open and spacious. The interior design choices were likely governed by the historic nature of the building, which was erected in the 1930s and served as a base of operations for the allied forces' South West Pacific Area command led by U.S. General Douglas MacArthur. Apple's Brisbane store was first discovered in a development application in 2011. After months without signs of progress, it was thought that Apple abandoned the site due to a bankruptcy filing from a major contractor attached to project. Renewed architectural renderings and accompanying blueprints were filed with city officials in August of 2013. The new plans called for the removal of sidewalk features directly in front of the store's facade, as well as the relocation of trees to create symmetry with the front entrance. 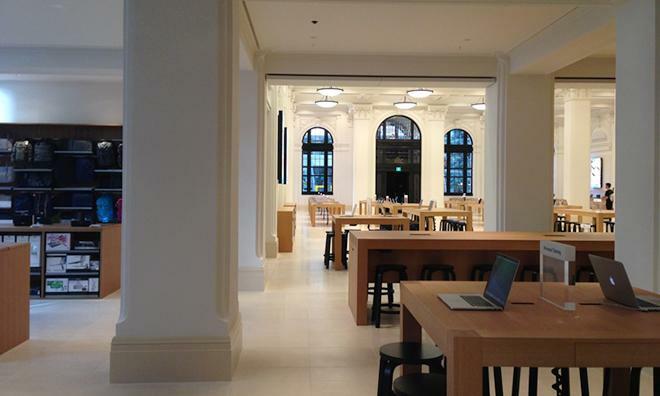 The Brisbane Apple Store is set to open this Friday at 10 a.m. local time.